1. Convenient and Delicious: I travel A LOT and trust me, finding quality airport food is not all that easy. Therefore, I never leave home without PaleoStix (my favorite) and/or PaleoKits. My kids love them, they pack easily, they are filling, and they taste really darn good. Busting out some beef jerky is also so much better than opening up a stinky can of tuna or peeling hard-boiled eggs in a teeny tiny airplane seat while your seat mates send silent looks of disdain your direction. Here’s the boys scarfing down some Berky (just berries and jerky) and PaleoKrunch Bars for an afternoon snack before running out the door to Karate. 1. In a large skillet, heat the coconut oil over medium high heat. Meanwhile, peel the plantains and slice into 1/4 inch thick pieces as shown below. 2. Fry the plantains in the coconut oil for about 3-4 minutes per side or until brown and crisp on the outside. 3. In a small dessert cup, add about a 1/4 cup sliced strawberries, sprinkle on some Nut Free PaleoKrunch and add another 1/4 cup sliced strawberries. 4. Scoop the cream from the top of the coconut milk can into a small mixing bowl and beat with a hand held mixer until it’s the consistency of whipped cream. Top the strawberries with a little more Nut Free PaleoKrunch and a small spoonful of the coconut whipped cream. 5. Take a couple of the fried plantain slices and stick them into the side of the bowl next to the whipped cream. 3. Scrumptiously Saucy: Steve’s Paleo Goods recently started a PaleoChef line that offers dressings, marinades, and the newest addition, Steak Sauce and Ketchup! It’s impossible to find steak sauce or ketchup at a regular store that’s not full of garbage. Impossible. That is why I LOVE that Steve’s Paleo Goods has bottled up this amazing line of goodness that frees up my time spent in the kitchen while offering a product that I can trust. Here’s a picture of our Monday night dinner which included delicious steak topped with PaleoChef Steak Sauce. I still love to make my own sauces and dips but when I simply don’t have time to do so; Steve always has my back. 4. Steve Gives Back: Steve’s Paleo Goods helps kids. Period. I can’t say enough about how awesome Steve’s Club truly is and the lives that are being changed could have all gone in a very different direction if it weren’t for this awesome endeavor. Steve’s Club helps at risk kids by giving them a safe environment to learn about fitness and nutrition, a place to hang out, a place to gain strength both mentally and physically and I know that every time I purchase food from Steve’s Paleo Goods, 15% of the proceeds goes to help keep Steve’s Club running. Check out this video detailing what Steve’s Club is all about and try not to cry. I dare you. 5. Steve Honor’s our Military: I’ve had the extreme pleasure of working with several branches of our armed forces and a huge problem that our brave men and women face is the lack of quality food when out in the field. I always recommend Steve’s PaleoMRE’s and PaleoKrunch Bars which are easy to pack and full of good food to fuel the ones who need it most. Furthermore, Steve’s Paleo Goods offers a 10% military discount which makes it that much easier for our armed forces to have access to real food when on the job. I’m always proud to recommend Steve’s Paleo Goods when working with the military communities and thank you Steve for your dedication and for honoring our armed forces. To receive your military discount, simply email [email protected]stevesoriginal.com. *Crazy but true, I wasn’t paid, bribed, or coerced into writing this blog post. 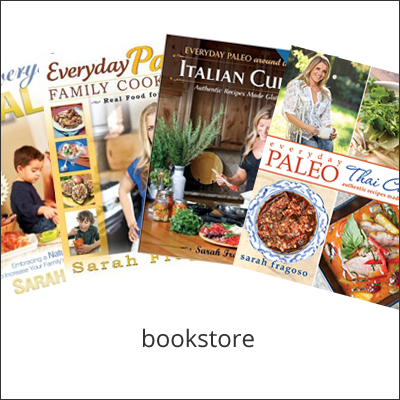 I do receive free samples from Steve’s Paleo Goods from time to time; however, I often order and pay for large quantities of food from Steve’s Paleo Goods and wrote this post because I darn well wanted to. That is all. Our family loves Steve’s Original! We are stationed overseas and our packages have always arrived in great condition in about a week. Thanks Sarah! It’s Suzette (we met during the GA seminar). I’m PCSing from DC to CA and totally forgot about Steve’s Original as I’m trying to figure out what to eat for lunch driving cross-country. I just emailed them :). Will be trying soon! Thanks for sharing !